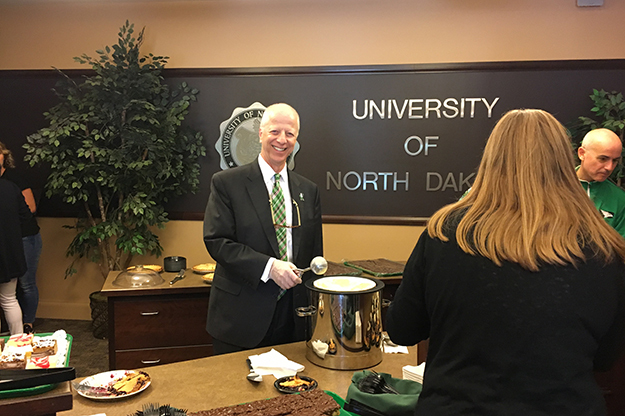 UND Provost Tom DiLorenzo (center) and Athletics Director Bill Chaves were among administrators who volunteered to dish up pie and ice cream Wednesday for the Sweet Tooth Social, part of State Employee Recognition Week at UND. 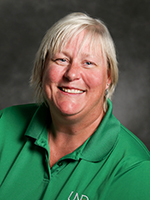 Angie Holkesvig chaired the UND Staff Senate committee that planned the week-long celebration. 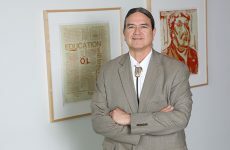 Photo by David Dodds/UND Today. This is Angie Holkesvig’s first year on UND’s Staff Senate, and as a new chair of the Staff Recognition Committee, it’s an opportunity to give UND employees the credit they deserve. But Holkesvig, an accounting specialist for UND Housing, joked that when she volunteered for the job – she didn’t know what she was getting into. Like she always does, Holkesvig embraced the challenge and took it to another level. On Wednesday, as many as 300 UND employees made their way to Carnegie Hall, at the south end of campus quad, to enjoy assortments of cookies, bars and pies – all served up by folks such as Vice President for Academic Affairs and Provost Tom DiLorenzo, UND Athletics Director Bill Chaves, Professor of Anthropology John Mihelich and more. It was one of the signature events of State Employee Recognition Week, and when putting it together, Holkesvig said, she was inspired by some of the events she and her daughter helped put together as co-owners of a wedding planning business. Carnegie was completely decked out like a reception, with decorative food trays and serving stations at Wednesday event, which in past years, has had a more informal vibe. The day, however, got off to an inauspicious start. When Holkesvig went to her car to retrieve the glass serving trays and bowls for the Sweet Tooth Social, they rolled out and crashed to the ground. Instead of dwelling on the bad luck, she dashed to the nearest local thrift story and purchased replacement ware that did the trick in a pinch. 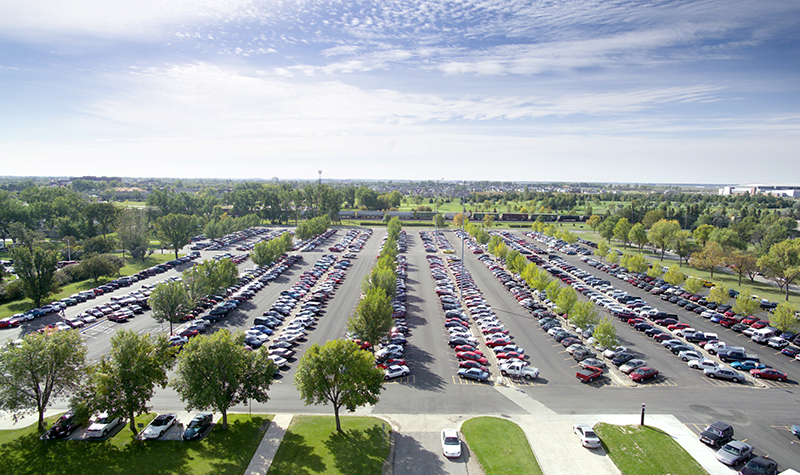 State Employee Recognition Week kicked off at UND with River Cinema Movie Day on Monday, when UND employees and a guest could enjoy a show and snacks at reduced prices. Tuesday brought the “Night Staff Breakfast” at Wilkerson Commons, followed by the Sweet Tooth Social on Wednesday. And today, to cap off the week, UND leaders, such as Associate Vice President for Finance Karla Mongeon-Stewart and Director of Human Resources & Payroll Services Pat Hanson helped out at the Taco-in-a-bag Lunch and Vendor Fair over the noon hour at the Memorial Union. Holkesvig couldn’t do it alone. She thanked Human Resources specialist Tyler Clauson, who’s headed up past staff recognition events, for all his support and advice; and UND Work Well Coordinator Andria Spaeth for her assistance; as well as all the others UND employees who signed up to volunteer. Holkesvig also made special mention of UND Catering Manager Andrea Green and all of the Dining Services staff members, who helped make everything look so professional. “They were just excellent,” she said.